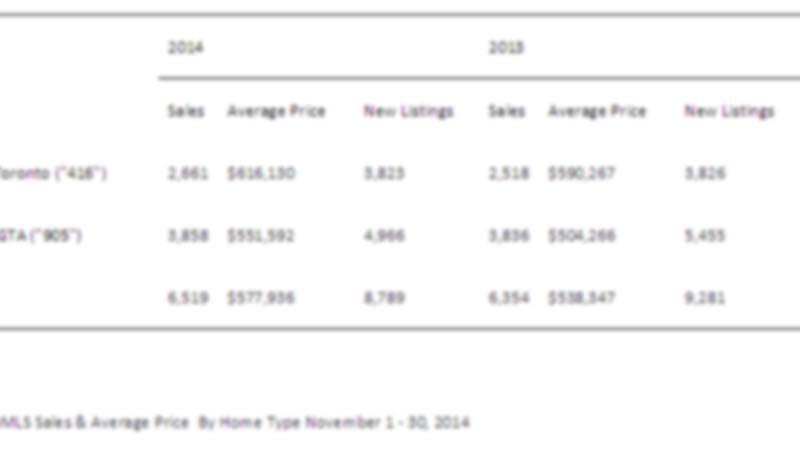 TORONTO, December 4, 2014 — Toronto Real Estate Board President Paul Etherington announced that Greater Toronto REALTORS® reported 6,519 residential transactions through the TorontoMLS system in November 2014. This result was up by 2.6 per cent compared to 6,354 sales reported in November 2013. Through the first 11 months of 2014, total sales amounted to 88,462 – up 6.6 per cent compared to the same period in 2013. “Even with a constrained supply of homes for sale in many parts of the Greater Toronto Area, buyers continued to get deals done last month. Households remain upbeat about home ownership because monthly mortgage payments remain affordable relative to accepted lending standards. This is coupled with the fact that housing has proven to be a quality long-term investment,” stated Mr. Etherington. “The robust average price growth experienced throughout 2014 has been fundamentally sound, with demand high relative to supply. Strong competition between buyers has exerted upward pressure on selling prices. Barring a substantial shift in the relationship between sales and listings in the GTA, price growth is expected to continue through 2015,” said Jason Mercer, TREB’s Director of Market Analysis.